When it comes to movies, sequels very rarely surpass the original. In fact, some may go so far to even say that sequels can ruin how you felt about the original. However, there have been those sequels that have surpassed the first movie and Dreamworks do know how to make a sequel that would be better than the first movie, just look at Shrek 2. Well, it’s with great pleasure to say that Dreamworks have done it again as Kung Fu Panda 2 is bigger and better than ever with twice the laughs, twice the action and double the quality in the story. The major flaw in Kung Fu Panda was that the Furious Five (voiced by Angelina Jolie, Jackie Chan, Seth Rogen, David Cross and Lucy Liu) were underused but in this movie. Fortunately, this isn’t a problem as they play a more important role in the story and we see a lot more of the characters and their personalities this time. Kung Fu Panda 2’s story is better than the first one as we see Po try to destroy the very thing that could destroy kung fu while we get to see Po’s past and how he came to be the panda he is today. Just like Kung Fu Panda, the story in Kung Fu Panda 2 reaches out to audiences of all ages. For children, there’s the more humorous, slapstick story with a message and for adults, there’s a more emotional and serious side that can be appreciated. Jack Black returns as Po and yet again does an amazing job, making Po larger than life. This time, the comedy is better as we see Jack Black deliver the lines with brilliant timing. Dustin Hoffman provides his voice for Shifu, Po’s Kung Fu master from the first movie, but he isn’t used as much as he was in Kung Fu Panda, however, this doesn’t take away anything from the movie. Kung Fu Panda 2’s animation is beautiful and very colourful and breathes life into the movie’s world of China as well as the characters. Every character in the movie was written brilliantly with the thought, care, love and attention it deserves and it’s clearly evident through the development of the characters. 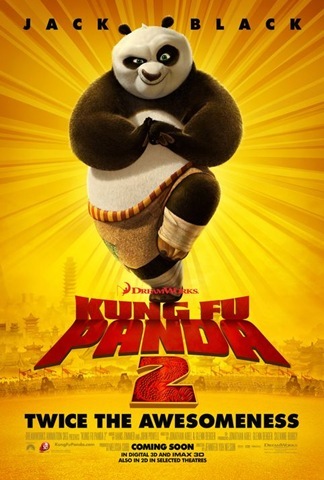 Kung Fu Panda 2 will win over the hearts of everybody with it’s stunning animation, it’s charming characters, it’s wonderful story and it’s fantastic soundtrack, definitely the best animation of the year so far. Dreamworks have made another successful sequel and has proven that it is possible to make a sequel that easily surpasses the first. However, does the curse of Shrek loom over Kung Fu Panda? This is something I’m sure people would fear. Shrek was great, Shrek 2 was better than the first, Shrek the Third was the worst of the series and Shrek Forever After was decent enough. Let’s just hope that, if there is a Kung Fu Panda 3, which I hope doesn’t happen, it will be better than the first two but with the standards set with this movie, it’s a big ask. If you love Jack Black or animated movies, you’ll love this, if you love both of them, you’ll simply adore it. I must warn that some of my reviews MAY have spoilers in them. I try my best not to spoil and 99% of the time I do not but if I do, I apologise. I just thought I should warn you nonetheless.